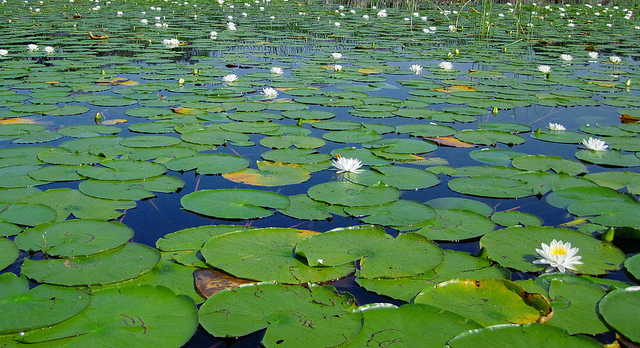 Nova Scotia has several blooming plants that grow in our fresh water lakes and ponds. 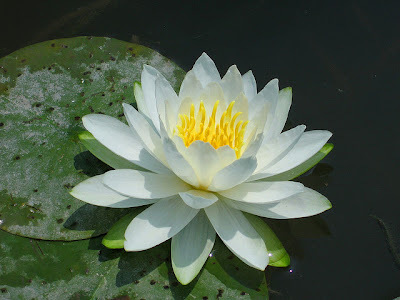 Probably the most beautiful is the White Waterlily, or Nymphaea Odorata. As you many gather from the "odorata" part of the Latin name, they are very fragrant. The white version, as well as a 4-petalled version called bull head (far less attractive to my eye), are fairly common around the still edges of lakes in our province. 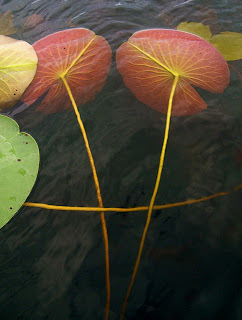 They are wonderful to come across while canoeing as you can glide in among them to really appreciate their beauty. The flowers and lily pads both float on stems longer than that necessary to reach the surface. As waves and wind lift and blow across them they bob along unaffected. The flowers themselves are upwards of 6-8” wide. The petals are pure white with a central arrangement of lemony yellow stamens. The flowers close every night and open again come morning. Waterlilies can be used for food, although I wouldn’t recommend it. The reason isn’t because they may be poisonous but because I far prefer to enjoy them floating on the still water. Another reason is because they always seem to be the home of all manner of creepy crawlies. Yuck. If you do seem to be overrun with the gorgeous flowers, here are some culinary clues on how to use them. I’m not offering any recipes. The following information was gathered from a few reliable sources but what can be eaten and what tastes good don’t always agree. The flower petals are edible raw, but it is best to cook the unopened buds like a vegetable. (Unopened would guarantee no insects inside, or nearly so…and I can only assume that cooking means boiling.) 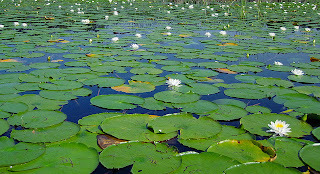 The lily pads are edible as are the ripe seeds which can be dried and ground into a flour. The unopened buds can also be pickled. One thing that I knew before researching was that the underground rhizomes are edible either boiled or roasted. Apparently they have a high starch content. I cannot vouch for the taste of waterlily, but just be aware that Nymphaea are not related to the Chinese and Indian lotus (genus Nelumbo), which are used in Asian cooking and sacred to Hindus and Buddhists. Many different cultivars are available at garden centres for inclusion in manmade or natural ponds. Colours range from white through pinks to quite dark reds. If you're lucky you may even be able to find blue varieties. 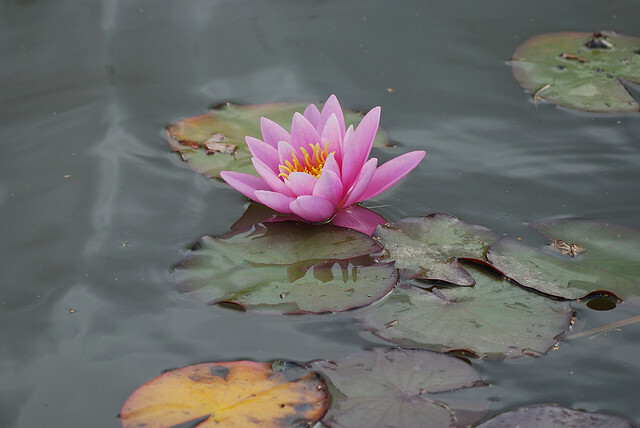 Pink waterlilies are quite unusual in the wild. Since they are native to the region, most are very hardy, but check the individual requirements of the plant you wish to purchase to avoid disappointment. Usually if it's sold locally, it's hardy to that climate. On a recent trip to Risser’s Beach Provincial Park on the Lighthouse Route of our province we saw several ponds that were literally covered with white waterlilies. Of course, I didn’t have the presence of mind to stop and take pictures. Hence the Flickr imagery. One thing I didn’t expect to see floating among them was the pink variety, which is far less common. They were absolute stunners. In all my years of being on the lake where I grew up I may have seen one or two—maybe. In one pond we passed there had to be at least a dozen. Next time I’ll take the time to stop and “smell the roses,” or at least photograph them.